With the increasing popularity of toys controlled by smartphone apps, electronics firm BeeWi launched the amazing KickBee robots. 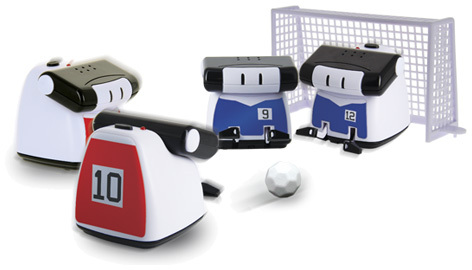 By combining a sophisticated toy with the world’s most popular played sport of football, kids (and their dads) can now set up a miniature pitch in seconds and be scoring goals just like the professionals. Whether you own an Apple device or one that works on the Android system, KickBee is for you. The pack contains the mini robot, a set of customisable stickers that can be adapted to represent a player’s favourite team, a mini goal frame and of course a football! Working via Bluetooth and with a range of 10 metres, each robot has fully directional steering and motion control. The super-fast response motor ensures you can take every opportunity of slotting the ball into an unprotected goal. It may not be quite World Cup class football, although it’s an incredibly fun toy that can be used on almost any flat surface. Please tell us what you think of the BeeWi KickBee.